After signing up for a MyGet account and creating a feed that serves as a Bower registry, you can work with Bower packages using the Bower command line and bower.json. 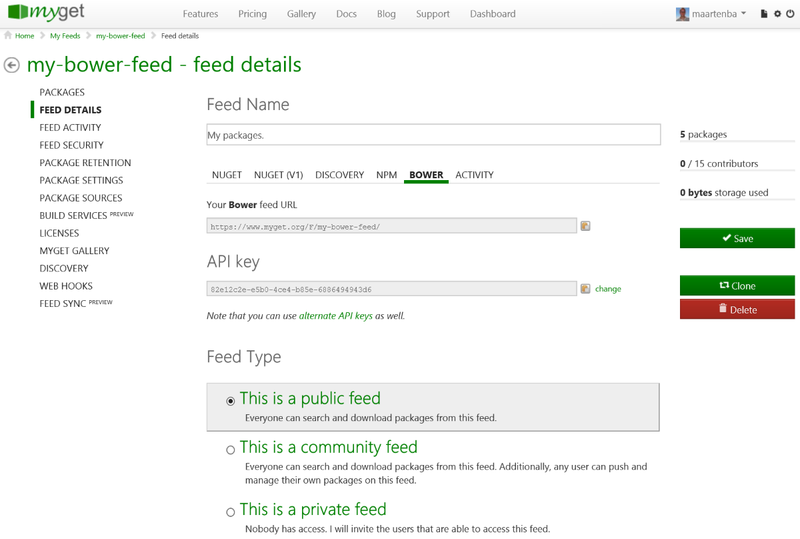 The full URL to your Bower feed on MyGet can be found on the feed details page. This URL can be used with any Bower-compatible client. Note that a pre-authenticated URL is also available for private Bower feeds. Note: If you have any special characters in your username or password, such as an @ or a space, make sure to use the URL encoded value (e.g. `%40` for @, %23 for #, %2F for / and so on). 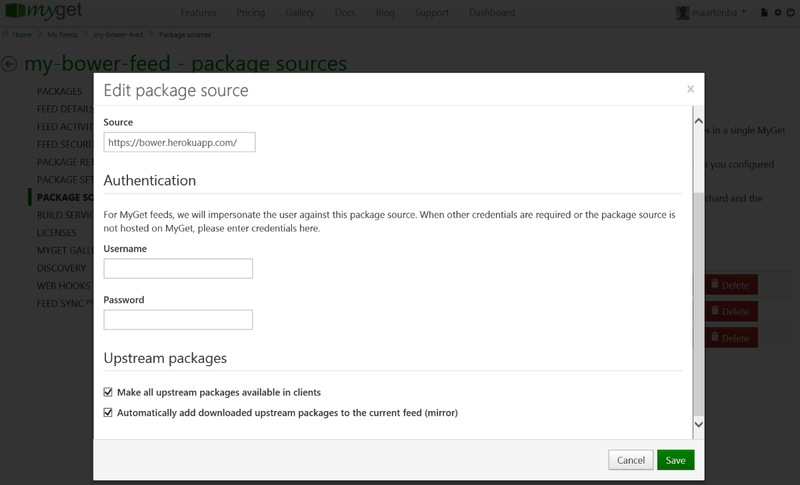 By default, your MyGet Bower feed will only contain packages you have explicitly added, either using the web UI or the Bower client. To have the public Bower registry blended into your own, go to the Upstream Sources tab, edit the Bower.io upstream source and enable the Make all upstream packages available in clients option and the the Automatically add downloaded upstream packages to the current feed (mirror) option. Note that using these settings it's also possible to blend more than one Bower registry into one. If you want to register a Bower package with a registry, you usually run the bower register command. This is not different with MyGet: bower register will register your package with a MyGet feed. Note: Make sure to use a pre-authenticated URL or include credentials in the registry URL if you want to register a package. Running bower install will make sure any dependency is downloaded and installed. You may want to run the SSL checker and verify your computer has all required certification authorities installed.